Just a quick shout today about my newly updated etsy shop! 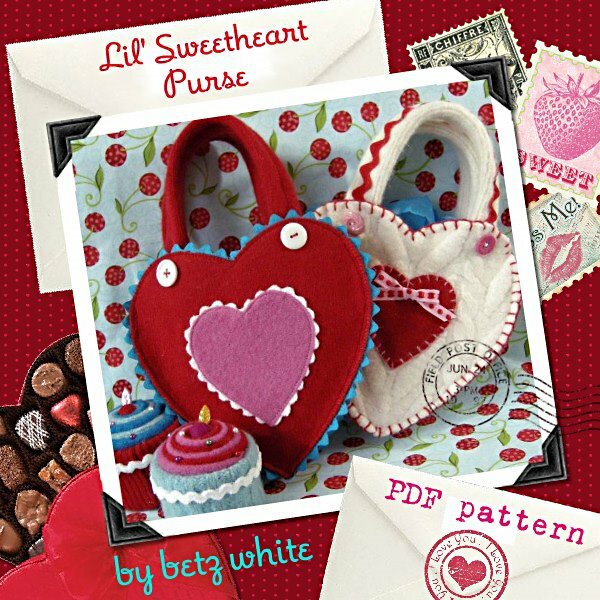 I’m so happy to present a new sewing pattern PDF for the Lil’ Sweetheart Purse. I had so much fun making these and I hope you will too. Each PDF (emailed to you after purchase, so you can get started right away!) includes instructions for making 2 different versions. The ivory purse is straightforward and fast using a nice thick felted fisherman sweater with an easy applique and blanket stitch edging. 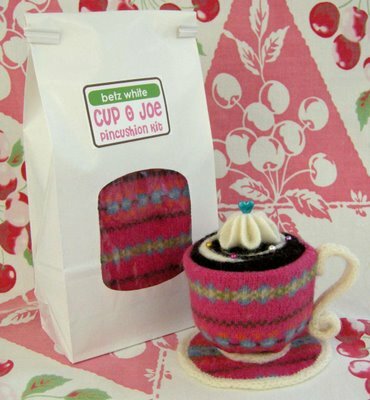 Also in the shop, ready for gifting are a fresh batch of my original Cupcake Pincushions as well as some Cupcake Tape Measure Kits and Cup O’ Joe Pincushion Kits. And do you remember why I offer you the Cup O’ Joes? Because “I Love You a Latte!” I do. I really really do. What a great batch of goodies for Valentine’s Day! I just bought a tape measure kit and I can hardly contain my excitement! I really wanted one with pink icing and a brown wrapper but when that was gone I had to try and decide all over again!! I’ve ALWAYS had trouble making decisions so I had to call in my 4 year old! Crazy I know! I think she thinks it’s for her! We chose a red and pink one because she says “I like strawberry cupcakes better than chocolate.” Worked for me! Absolutely adorable!!! What a beautiful idea! I just love it! These are so cute! I love the cupcakes. The whipped cream on the java is great! Aw, these little heart purses are so adorable! My nieces would love these! I love the different trim you used. Oh, geez, this is the cutest one ever. I can’t get over teh whopped cream on top and that curvalicious handle. Tooooo cute. CUTE CUTE CUTE as heck! Pure eye candy! 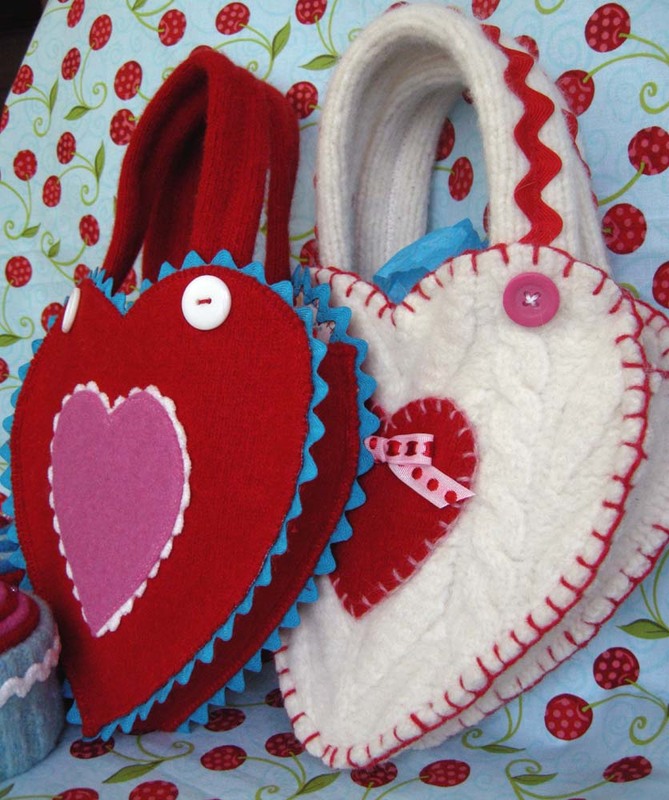 Those little Valentine projects are darling. I love the little sweetheart purses and I love that you make it so easy to download the pattern. You knew we would be envious of the hello kitty comb…my question is when did you get this? I had one when I was a girl in the 80’s but haven’t seen them since I lost mine a decade ago! Thanks for including it. You’re charming as always. 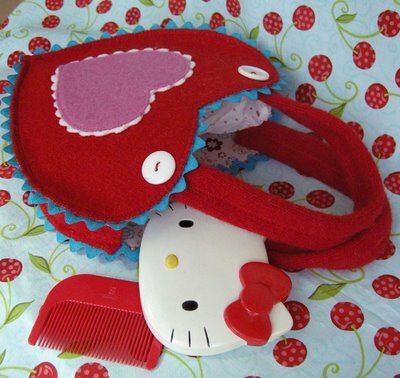 Try looking on eBay for the Hello Kitty mirrored compact! :) Mine is soooo old! 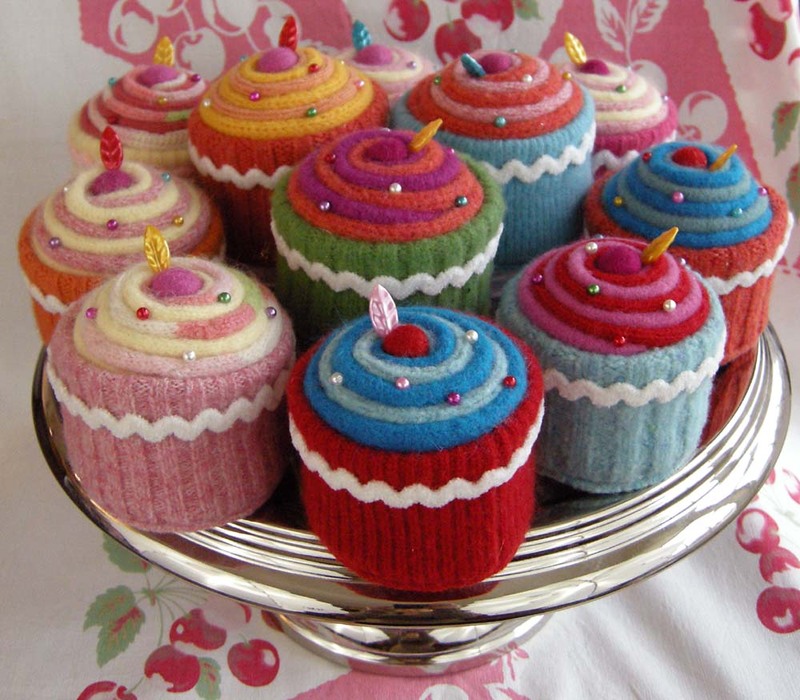 I just fell in love with these cupcakes when I first saw them! I’m not much of a sewer myself but want one just to show off in my craft room! I posted a picture of your cupcakes and a link to your Etsy shop on my craft site TWOHEARTSTOGTHER for my visiters to have the privilege to get their hands on some of your cake cushions! The perfect gift — fat free, but chock full of goodness! Love your blog and handmade work! I love all your ideas and I wish to ask you where I can find the CUP o Joe Kit. I’ve seen on your Etsy Shop but there isn’t this produtc. I’m sold out of kits but will contact you when I have more.